West Virginia facts and history plus travel and tourism information. Abbreviations: WV (postal), W. Va.
West Virginia's lands were once occupied by Delaware, Seneca, and Shawnee native tribes. In fact, the region was part of Virginia from Virginia's founding up through the Civil War. Confederate General "Stonewall" Jackson's birthplace is here, and the Civil War began on West Virginia soil at Harpers Ferry. Divided over the issue of slavery, West Virginia separated from Virginia in 1860 and became the 35th state to join the Union on June 20, 1863. During the past 50 years, Senator Robert Byrd has made his mark on the state, bringing federal funds for an extensive road network to connect West Virginia's isolated Appalachian communities. Visitors can travel on scenic highways through rolling highlands, dense forests, and picturesque mountain streams. 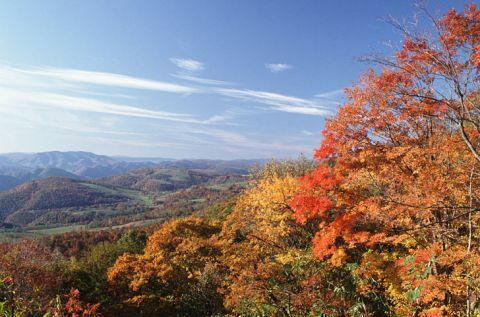 The Allegheny Mountains run through the state, and their Autumn foliage colors rival New England's. West Virginia is characterized by coal mining and mountain music. A hiking trip highlights West Virginia's beautiful forests, and streams running off the mountains host other recreational activities.